Evolutionary tweaks to DNA that bosses genes around may have grounded some birds. New genetic analyses show that mutations in regulatory DNA caused ratite birds to lose the ability to fly up to five separate times over their evolution, researchers report in the April 5 Science. Ratites include emus, ostriches, kiwis, rheas, cassowaries, tinamous and extinct moa and elephant birds. Only tinamous can fly. Regulatory DNA gets its name because it’s involved in regulating when and where genes are turned on and off. It doesn’t contain instructions for making proteins. Researchers have long debated whether big evolutionary changes, such as gaining or losing a trait like flight, occur mostly because of mutations to protein-making genes tied to the trait, or result mainly from tweaks to the more mysterious regulatory DNA. Revealing the importance of regulatory DNA in shaping evolution could shed light on how closely related species with the same genes, such as chimps and humans or moas and tinamous, can develop vastly different looks and abilities. Scientists have tended to stress the importance of protein-coding changes affecting the evolution of various traits in many organisms. Examples are relatively easy to find. For instance, a previous study of flightless Galápagos cormorants suggested that mutations in a single gene shrank the birds’ wings (SN: 6/11/16, p. 11). In general, mutations that alter proteins are likely to be more damaging than changes to regulatory DNA, and thus easier to spot, says Camille Berthelot, an evolutionary geneticist at the French national medical research institute INSERM in Paris. A protein may be involved in many biological processes throughout the body. “So everywhere this protein is [made], there’s going to be consequences,” she says. By contrast, many pieces of DNA may be involved in regulating a gene’s activity, and each may work in only one or a few types of tissue. That reduces the damage that changing one regulatory segment might have, rendering those bits of DNA easy targets for evolution’s experiments. But, at the same time, it also makes it much harder to determine when regulatory DNA is actually involved in big evolutionary changes, says evolutionary geneticist Megan Phifer-Rixey of Monmouth University in West Long Branch, N.J. Those pieces of DNA don’t all look alike and may have changed a lot from species to species. Evolutionary biologist Scott Edwards of Harvard University and colleagues got around that problem by deciphering the genetic instruction books, or genomes, of 11 species of birds, eight of them flightless. The researchers then lined up those genomes alongside already completed genomes from birds including ostriches, white-throated tinamous, North Island brown kiwis and Emperor and Adélie penguins as well as 25 flying bird species. The researchers were looking for stretches of regulatory DNA that hadn’t changed much over the course of the birds’ evolution, an indication that the DNA performs an important function. Among 284,001 shared, relatively unchanging stretches of regulatory DNA, the researchers found 2,355 that had accumulated more mutations than expected in ratite birds, but not in other bird lineages. The plethora of mutations indicates that those bits of regulatory DNA are evolving faster than other parts of the genome, and may have lost their original functions. Tracking when evolutionary accelerations happened led the researchers to conclude that ratites lost flight at least three times and possibly as many as five times. Those regulatory DNA bits tended to be located near genes involved in limb development, an indication that they might tweak gene activity to produce smaller wings. The team tested the ability of one such regulatory DNA bit, called an enhancer, to turn on a gene in developing embryonic chicken wings. A version of the enhancer from elegant-crested tinamous — which can fly — turned on the gene, but a version of that same enhancer from the flightless greater rhea didn’t. 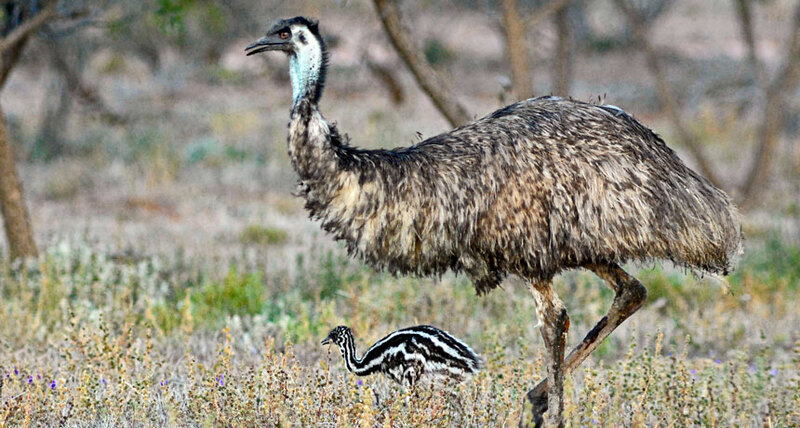 That result indicates that changes in that enhancer disabled its wing-development function and might have contributed to flightlessness in rheas, the scientists say.